Board-certified Plastic Surgeon, Dr. Amir Moradi uses Radiesse to dramatically improve aged skin. Radiesse is a filler that is comprised of calcium hydroxyapatite microspheres suspended in a water-based gel. This naturally occurring substance is typically found within the bones and teeth. 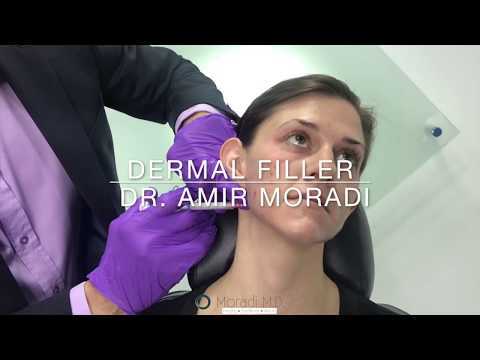 Dr. Moradi will administer this injection into areas that need extra volume and wrinkle reduction, typically in the cheeks or around the mouth. As Radiesse is an ideal method for adding fullness and facial contouring, it is a very popular treatment at Moradi MD in San Diego, CA. It is also a dermal filler that simultaneously encourages collagen production, which allows its effects to last up to one year. If you're seeking an effective treatment for adding volume to thinning and aging skin, then Moradi MD invites you to schedule a consult and consider the benefits of undergoing a Radiesse injection to smooth out and contour your skin.